The Association presents these dates in good faith that they are correct, however buyers are encouraged to check with agents, stud advertising, or contact the studs directly to confirm on-property dates. The South Australian Stud Merino Sheepbreeders' Association is pleased to host what is arguably one of the world's most successful multi-vendor Merino and Poll Merino sales. South Australian bloodlines have a large sphere of influence across the local and global Merino industry, with strong demand for their large frame, heavy-cutting ability, and increasingly good fibre. The Adelaide Ram Sale has set the benchmark for multi-vendor sales in Australia, recording an average of $12,814 in the 2017 sale, and a credible $11,533 average in 2018 despite greater numbers and a tougher season. the 1980s. The recent top prices may not match wool’s heyday but there is definitely an air of excitement around the sale. The sale has a strong stud and commercial client following from breeders looking to take their flocks forward. Peter Meyer of the Mulloorie Stud said the Adelaide Ram Sale had become the ‘mecca’ for quality Merinos, particularly Poll Merino rams. sales go,” Mr Meyer said. He praised the efforts of the State’s breeders to produce high-quality meat and wool. Producers who have remained with the Merino are now reaping the profits of this dual purpose animal with the recent strength of the markets in both fibre and meat. Commercial producers looking to add value to their enterprise should seriously consider investing in the quality genetics on offer at the Adelaide Ram Sale. Stud Merino breeders also offer rams at the Classings Classic Ram Sale, held annually at the Murray Bridge Racecourse. 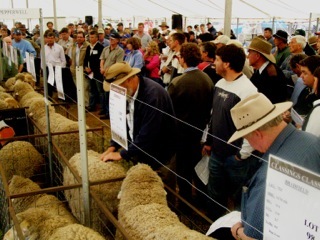 Sheepclasser Bill Walker and his wife Rose, who runs the company's Fleece Testing Laboratory, established the sale in 2002, with Bill handpicking the studs and sale rams for the event . “Due to this selection the end result has been an animal rich in productivity, exhibiting highly aligned fibre, huge staple length and density on an early maturing, plainer bodied carcase,” Bill said. " All of these traits appease the commercial and stud client in addressing today's issues, partly involving the mulesing discussion". The growing inclusion of ASBV's by most studs are becoming an integral part of the Classings sale.